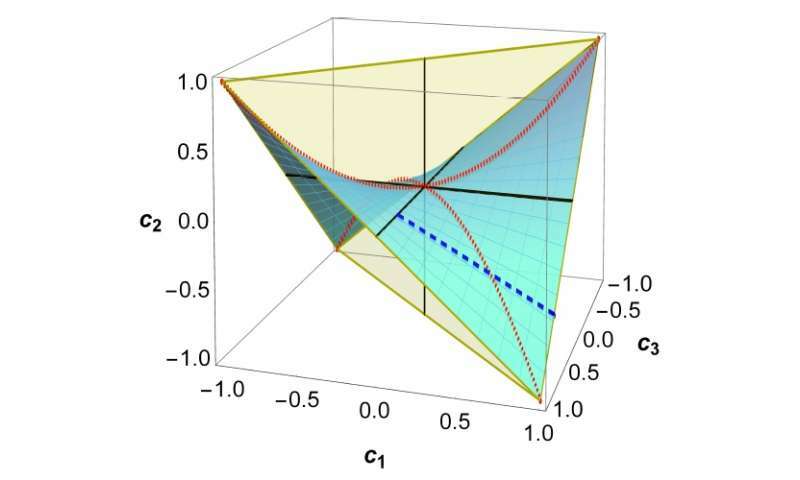 Figure of the “freezing surface” of quantum discord-type correlations. Credit: Marco Cianciaruso, et al. (Phys.org)—Physicists who work on quantum technologies are always looking for ways to manage decoherence, which occurs when a quantum system unavoidably interacts with the surrounding environment. In the past few years, scientists have discovered that some quantum correlations can be "frozen" in a constant state and remain that way in the presence of noise, potentially offering a protective mechanism against decoherence. So far, however, quantum freezing has been shown to exist only on a case-by-case basis and under certain conditions, and its potential protective effect has not been fully exploited. Now in a new paper to be published in Nature Scientific Reports, physicists Marco Cianciaruso, Thomas Bromley, Wojciech Roga, Rosario Lo Franco, and Gerardo Adesso have shown that the freezing of quantum correlations is universal—that is, it is independent of the method used for measuring the correlations. While working on this proof, the scientists also found that it may be possible to not just prevent but also reverse the effects of decoherence under certain circumstances, which they show by demonstrating the existence of an intriguing new phenomenon modelled by a global rephasing channel. "The greatest significance of the work is to show that a general form of quantum correlations must remain frozen and protected in the presence of some, usually detrimental, decoherence effects," Lo Franco, who is with the University of Nottingham, the University of Palermo, and the University of São Paulo, told Phys.org. "This fact implies that any further well-defined measure of quantum correlations must freeze during the evolution under the same conditions. Our work thus appears to settle the debate about the universality of the freezing phenomenon of discord-based quantum correlations." Overall, much of the research on quantum correlations has focused on entanglement, which is one specific type of quantum correlation. As the physicists explain in their paper, there is a general consensus that all quantum correlations between two systems in a pure state can be considered entanglement. Although it sounds like entanglement is the dominant type of quantum correlation, in reality entanglement may represent a negligibly small portion of all quantum correlations because not all states are pure. When two systems are exposed to a noisy environment, they will generally be in a mixed state, and a certain portion of mixed states are non-entangled. Consequently, quantum correlations between these systems do not necessarily reduce to entanglement, but can manifest in a more general form called discord-type quantum correlations. Since realistic quantum systems often involve mixed states, discord-type correlations are much more prevalent than entanglement, although they are not as well understood. In this context, the freezing phenomenon is particularly interesting because it is exhibited specifically by discord-type correlations, while a similar feature for entanglement has remained elusive. This difference aligns with other emerging research that suggests that discord-type quantum correlations are more robust than entanglement against noise. For instance, entanglement can suffer so-called "sudden death" when exposed to noise, but such rapid vanishing cannot been observed for discord-type correlations. In this sense, freezing can be considered a very extreme form of robustness to noise, as it could theoretically allow any quantum protocol to operate with a performance that is completely unaffected by noise. Such protection would be extraordinarily appealing for future developments of quantum technologies, including communication, computation, sensing, and metrology. The scientists' proof of the universality of quantum freezing consists of a lengthy mathematical description, but they explain that the main requirement is that the method used to measure the discord-type correlations must be a genuine distance-based geometric method, "exploiting distances which are convex and non-increasing under quantum channels." As long as the method meets these basic requirements, freezing occurs independent of the specific distance used. By proving universality, the results show that previous demonstrations of freezing were not merely mathematical accidents, but that the freezing of discord-type quantum correlations is a true physical phenomenon. The physicists' additional finding—that a global quantum control channel can reverse the effects of decoherence for certain mixed states—could also have implications for quantum technologies, in particular quantum error correction. They explain that the channel can be understood as "refocusing" the qubits that have been affected by noise. The proof still leaves room for further research aimed at proving the universality of freezing from only the basic properties of quantum correlations, without the need to use a geometric method. The results of such a study could lead to a better understanding of the physical origins of frozen quantum correlations, and may even shed light on the scientists' hunch that the phenomenon is related to classical correlations. "We are currently researching conditions for other quantum features to remain frozen or almost frozen under various noisy dynamics," said Adesso, at the University of Nottingham. "In another paper, some of us have already proven that quantum coherence can remain frozen in the same conditions as discord-type correlations, which is quite a strong result since long-lived coherence is a useful resource for physical and biological sciences. We are also working on experimental investigations with quantum optics and nuclear magnetic resonance, with the aim to exploit mixed quantum states with frozen discord in order to preserve their operational value in applications such as quantum metrology. The physical cause of freezing is not known yet, but our results suggest that a deep physical origin of this phenomenon is expected so that we are investigating it." More information: Marco Cianciaruso, et al. "Universal freezing of quantum correlations within the geometric approach." To be published. In this complex fundamental paper, among the basic assumtions, they never consider any effect of the Bohr collapse of the wave function, very non linear, which if true must destroy this freezing, when the collapse occurs !! For this reason, any experimental verification of this freezing will prove that the Bohr collapse of the wave function never occurs, in particular when the global rephasing or the reverse the effects of decoherence will be observed, which must be destroyed if any collapse occurs !! This is very fundamental, because it gives a way to test experimentally betwwen some of the different interpretations of quantum mechanic and to show that Bohr collapse interprétation is false or true ! If never a collapse is observed, with refocusing possible, this favors the Everett model of splitting multiple multiverses, corresponding to the quantum mathematical equations, that are unable to describes the collapse, very non linear, like cutting the wave function ! !